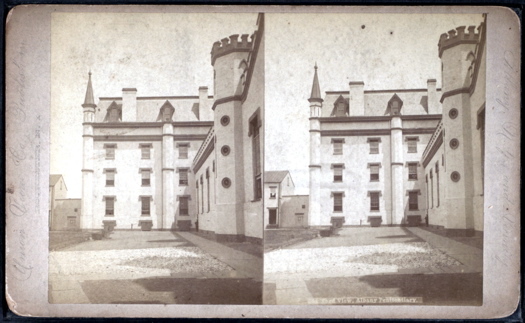 The Albany Penitentiary once stood near what today is the V.A. hospital. From petty thief to Lincoln assassination conspirator, if you were a criminal in Washington D.C. in the 1860's -- you were going to be sent up the river. Way up the river. To Albany. The Albany Penitentiary served for decades as the prison for the District of Columbia. With the old downtown jail becoming inadequate to house what were characterized as "the vilest dregs of society, the rakings of the gutter and the brothel, the profligate, and even the diseased," Albany County resolved in 1843 to create a new style of penitentiary aimed at "moral reformation of the convict," but one where "labor performed in the prison shall produce a sufficient income for its maintenance." For some it truly became a prison of their own making, as county prisoners from the old jail were put to work building the new one. They moved themselves in by 1846, and continued to build, including a women's wing, through 1848. In all, the institution covered three acres, enclosed by a 14-foot high brick wall complete with guard-houses. The entire goal of the institution was to show not only that prisoners could earn their own keep, but that by making them busy they would not return to their criminal ways. Most of the inmates were petty criminals serving six months or less, guilty of such offenses as assault, horse theft, indecent exposure, and passing counterfeit tobacco stamps. Petit larceny was by far the most common offense, which administrators took care to separate from the less common offenses of "stealing key of mail bag," "stealing money from mail," and "stealing at West Point." The Albany Penitentiary's success as a model reformatory (whipping and the crucifix: no; cold shower punishment: yes) was quickly rewarded. The State Legislature passed act after act permitting other counties to use the facility. The growing roster of inmates was put to work caning chairs and making inexpensive shoes. Female inmates worked doing laundry. The Civil War threatened this model of penal self-sufficiency. Petty criminals were forgiven their sentences if they enlisted in the Union Army. The number of inmates fell and the southern market that supported the penitentiary's shoemaking factory disappeared. But penitentiary officials were alert to opportunities. When they learned that the District of Columbia's penitentiary was being taken over by the United States Arsenal, they arranged for Albany to be the penitentiary for the District of Columbia. It began in September 1862 with the transfer of 131 convicts, and continued for decades after the war ended. Confederate prisoners of war, D.C. swindlers, and Albany pickpockets all ended up in the same institution, and the institution profited nicely. The most famous convicts ever sentenced to time in Albany never arrived here. Four of the convicted conspirators in the Lincoln assassination -- Dr. Samuel Mudd, Edman Spangler, Samuel Arnold, and Michael O'Laughlen -- were sentenced to serve in Albany. They boarded a ship in the Potomac expecting a long trip north but were surprised to find themselves sailing decidedly south, to a military prison in the Dry Tortugas, islands at the end of the Florida Keys. 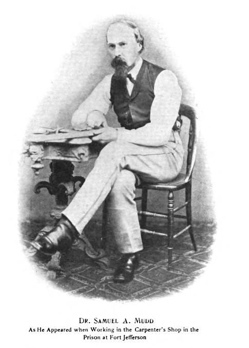 Despite his cries of injustice at the sentencing, Dr. Mudd, convicted of conspiracy for setting John Wilkes Booth's broken leg after the Lincoln assassination, apparently found the extremely southern prison more to his liking. A friend wrote to Mudd's daughter that "He is doing a great deal better than he would have done at Albany." The old Albany Penitentiary was finally closed when a new one opened well out of the city, on Albany Shaker Road, in 1931. It would be twenty years before the site was was put to use again, with the opening of the Veterans Administration Hospital in 1951. Carl Johnson blogs about history and other fun stuff at mynonurbanlife.com. Ah, Dr. Mudd. The prison he ended up in is Fort Jefferson. It still stands today and is an amazing place to visit, albeit only via boat or plane. The term 'up the river' was referring to going to sing sing prison from a NYC person. About once a week, I take a shortcut that runs between the Hackett Middle School and the V.A. Hospital. If I'm with my other half, I almost always poke him in the arm, point to the site, and say, "You know, the old penitentiary used to be right there." He's probably sick of hearing that. I remember reading a story about one prisoner who embedded needles in cork and rigged them to drop when a candle burned through the string that held them. He hoped that, by blinding himself, he could win some form of clemency to escape the harsh conditions of the Albany penitentiary. He succeeded in blinding himself but, if I recall correctly, it didn't win him an early release. @tj, you're right about the "up the river" origin -- but this article was already long for the web! @paula, I tried to find out for sure, but I think that Hackett must have co-existed with the penitentiary right behind it for at least some period of time. I'm thinking those grounds would be a real archaeological treasure trove. I never paid much attention to the marking of "Penitentiary" on the early maps. 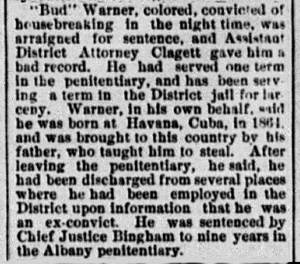 Then someone posted on a genealogy site asking for information on the Federal penitentiary in Albany. I was sure there never was such a thing . . . and then I found out there kinda was. Why call it the department of corrections if there are so many repeat offenders? Should be called the department of time-out, and correctional facilities renamed "the corner." Seriously, there's no correcting going on. it's like higher ed for criminal activity. "I stole a car with expired tags." "That stinks. Next time you steal a car you should steal one with a current registration."